Here are some investigations and challenges for you to choose from to match the maths you wish to teach and the time you have available over this busy festive period. How many ways can a star be drawn using 2D shapes? These include questions to ask as they investigate. KS1 - place 2D shapes on top of each other and drawing round the shape. KS2 - make dots on each vertex of a regular shape to make internal stars. How much paper is needed to wrap a parcel? Use 36 interlocking cubes to make different cuboids and investigate the amount of paper needed to wrap each one. Folding and cutting to make a paper star – with a lot of opportunites to reinforce skills. Step-by-step instructions and follow up questions included. All cones grow in spirals. Start at the base of the cone and use gold or silver (or any colour) pens and follow the spiral up as far as possible. Now count all the spirals that start round the base, both of these cones have 8 spirals - a Fibonacci number! Then explore the spirals made by using the numbers in the Fibonnacci sequence. On the first day one present was sent, on the second day two presents were sent...and the first present was sent again - so that's four presents sent altogether so far. How many presents will be sent altogether by the end of the 12th day of Christmas? 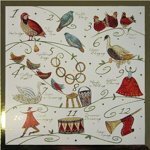 12 days of Christmas - starting points for different ages. Here are a few short, one-off simple activities that can be done with only paper and crayons - in those spare moments between Christmas rehearsals. They are interesting, fun maths tasks providing an opportunity for exploration and problem solving.